Register by Friday, April 12, 2019 and save up to $800. Register by Friday, April 19, 2019 and save up to $800. Register by Friday, April 26, 2019 and save up to $800. WASHINGTON DC USA -- EMPLOYEE BENEFIT UPDATE NEWS SERVICE -- MARCH 25, 2019: The Tenth National Accountable Care Organization (ACO) Summit, www.ACOSummit.com, the Ninth National Bundled Payment Summit, www.BundledPaymentSummit.com, and the Fourth National MACRA MIPS/APM Summit, www.MACRA Summit.com, will be held on June 17 - 19, 2019 collocated at the Grand Hyatt in Washington, DC. The three events will share a joint plenary session. Registrants may attend all three event in person or online (live webcast and archived for 6 months). 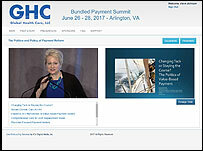 MACRA Keynote Address: Are Alternative Payment Models Better than Fee for Service? 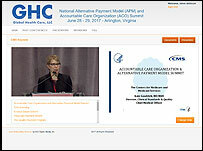 XV: What's Next for Next Gen ACOs? The ACO Summit, Bundled Payment Summit, and MACRA Summit are now offering a limited number of partial and full Tuition Scholarships to qualifying representatives of local, state and federal government, consumer advocate organizations, safety net providers, academics, students and health services research organizations. Click here for more ACO Summit tuition scholarship information. Click here for more Bundled Payment Summit tuition scholarship information. Click here for more MACRA Summit tuition scholarship information. Physicians: Approval for 15.00 AMA PRA Category 1 Credits. Pros: subject matter immersion; professional networking opportunities; faculty interaction. For sponsorship and exhibit information, visit www.ACOSummit.com/promotional-opportunities/, www.BundledPaymentSummit.com/promotional-opportunities/ or www.MACRASummit.com/promotional-opportunities/ contact Justin Sorensen, Exhibit Manager, at (206) 452-0609 phone, (206) 319-5303 fax, or exhibits@hcconferences.com. For Summit registration information, visit www.ACOSummit.com/registration/, www.BundledPaymentSummit.com/registration/ and www.MACRASummit.com/registration/, email registration@hcconferences.com, or call 800-503-3597.